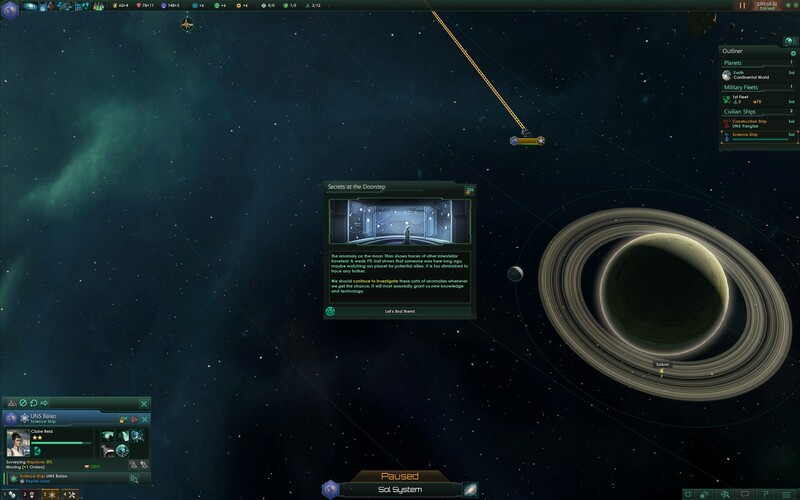 Stellaris is a new space 4X game released on May 9th. I’ve been playing it over the past week and it’s pretty cool! Some comments after the line. Space-based settings and detailed strategy games are a match made in heaven for me; ever since Master Of Orion back when I was a student. A friend of mine used to bring a crate of beer around and just watch me play. He’d offer me drinks but I’d never get past the first bottle (I’d be too rapt in the game) and I’d offer for him to play but he’d be put off by the Byzantine interface. He was quite happy to watch the story of my Epic Struggle unfold. Zip forward over 20 years (eek). There have been plenty of space 4X games that have been released since then but none have grabbed me in the same way as MOO. It’s hard to pin down why; recent games have had improved graphics and expanded gameplay. Most have had improved interfaces (in the case of Endless Space, dramatically so). Some I’ve put a lot of time into. But they’re not the same. We’re going to science it until it begs for mercy. 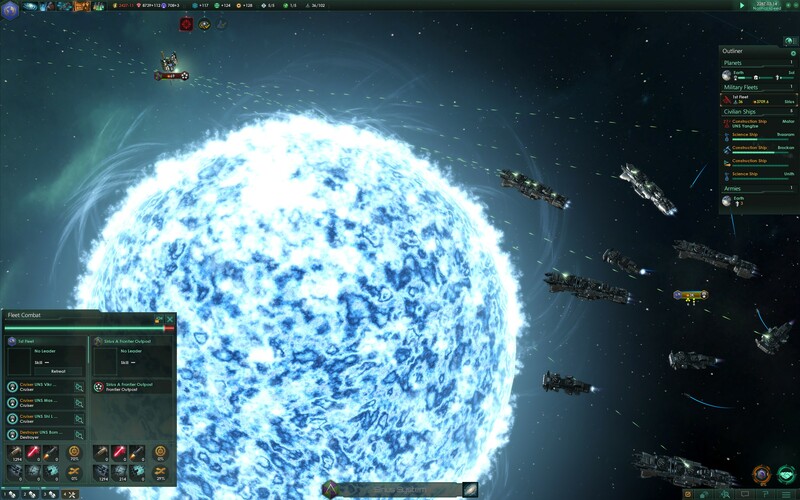 Stellaris has a unique feel to it that makes me feel I’ve finally found my MOO replacement. And while the UI and gameplay are decent it’s really the atmosphere that’s the big difference. Your empire starts just as your race has discovered interstellar flight. The type of faster-than-light travel varies by race but the general gist is that there’s a wide universe out there to explore. And exploration really is key. You send out your science ships who explore, survey and investigate the various unique aspects of the galaxy. There’s loads of history, lore and back-story that’s there to be discovered and it really gives a sense of context to the game. All the exploration spice stops that feeling of sterility some strategy games have. Some of these anomolies lead to quest ‘chains’ where you follow breadcrumbs around, slowly piecing together a mystery. They often have gameplay effects but not always; many times these are purely there for flavour. While all this science is going on you pursue the standard 4X stuff; expanding your empire, fighting and keeping your civilisation moving forward. There’s been a lot of design aimed at making the game re-playable; you get three random selections of techs to research in each of three scientific fields and when one completes, you get another random sample. Strategic resources are rare and randomly spread throughout the galaxy (unlike the standard resources of energy and minerals). Each can be used for specialised, powerful things. So your game may change radically depending on whether you’ve got those resources near you and if you’ve managed to get the technology to exploit it. Captain, I’m not sure the potato-guns are having any effect! The fighting looks pretty cool; while the game is real-time (with pause) you don’t need to micro-manage your units. They use the best tactics to suit their weaponry (sort of) and so you just sit-back and watch the fireworks. 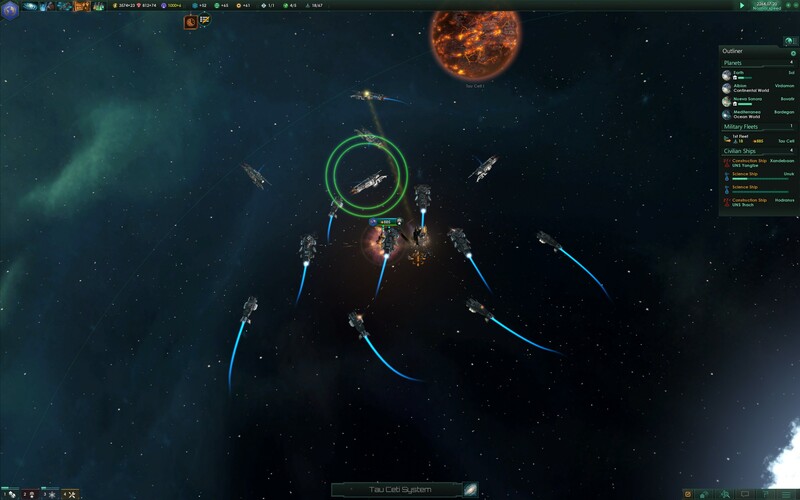 Of course, the real strategy has happened before that when you design and build your ships from available technology. It has a believable progression, starting with bullets and missiles before moving into the Uber Death-Rays. Each weapon type has unique attributes and it’s perfectly possible to beat a superior opponent if you counter their ship’s technology. The game tries to make itself more manageable late in the game while keeping a human/alien/sentient-gas face. 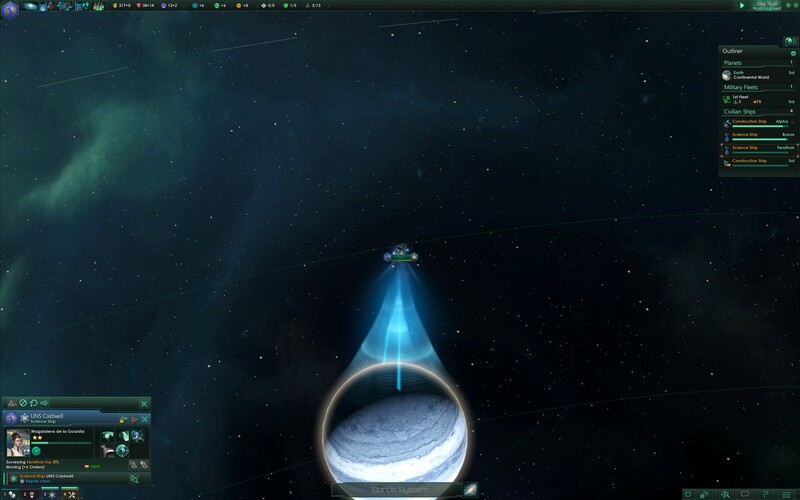 You can group planets into sectors which then run themselves (against some parameters you provide). So you never have more than 5 or so planets to micromanage. Just don’t give away the homeworld, Vir. 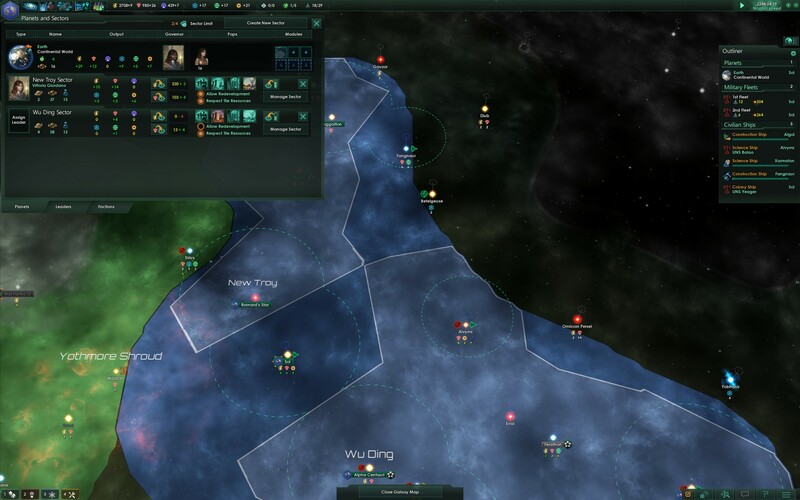 Sectors (as well as planets, fleets and science ships) all can have leaders attached to them who change how they run. As the game progresses these leaders gain experience and quirks, age and (eventually) die. It can make a massive difference to lose your experienced Admiral to old-age just before a major engagement! On the downside there’s no spying and in the mid-game your science ships and their exploration tends to die away in importance. There are apparently some fixes on the way to give them more to do and this didn’t stop me loving it but it certainly made it feel less unique than in the early stages. It’s a massive game; there’s alliances and diplomacy, late-game threats, factions and ethics divergence and some very cool quest lines. It’s a great game with loads of re-playability. While it’s real-time with pause it plays out slowly with an epic scale, tracking your civilisations ascent to the stars. It certainly got it’s hooks into me.